Interest in magic and sorcery has been rekindled in recent years due to the success of popular fiction and films such as the Harry Potter novels and The Lord of the Rings. Surprisingly, much of that fancy is founded on fact, and now readers looking for the history and lore behind their favorite fantasies will have a resource on which to rely. With more than 400 concise, expert entries, The Encyclopedia of Magic and Alchemy is a fascinating A-to-Z reference to the history of the Western magical and alchemical traditions, sorting history from myth and folklore and examining mystical beliefs through the ages. With roots reaching back to ancient Egypt, the classical world, and the Middle East, magic and alchemy have often played an integral part in science, politics, and religion. From the quest for the Philosopher's Stone to 20th-century wizards like Aleister Crowley to contemporary pagans and wiccans, the full range of Western magic and its influence on society is documented here. Topics covered include history, lore, famous people, philosophies, procedures, materials, rituals, and relationships to science. 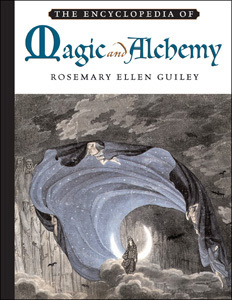 "...the definitive guide to magical and alchemical figures, literature, objects, and terms. Recommended." "It is difficult to imagine a reader approaching this book with a magically inclined question and walking away unsatisfied...could be the one place for a student to find reliable information on an obscure topic." "Coverage is extensive...well written and researched...would be useful and interesting for patrons in all academic libraries as well as in large public libraries." "Recommended for public and academic libraries that have a high demand for this type of information." "...user-friendly, comprehensive, and informative...A well-assembled series of instructive black-and-white photos and illustrations enhance the usefulness of this work." "...[a] comprehensive compendium of magical lore and traditions..."